I really liked passing out stickers last year at ALT & BlogHer so much that I think I need to keep up that little trend (but not make the same mistake of slicing my fingernail in half). Since I was running low on stickers, I went a little die-cut crazy yesterday with my Silhouette machine. I made almost 200 vinyl die-cut stickers! There’s something about weeding out the negative space on a vinyl sticker that’s so therapeutic. I’m sure if I did it for about 15 minutes a day, I’d be a much more centered person. This time around I still made my “i still love you” stickers, but I added to the mix with some little hearts. I designed the heart by hand-calligraphing the heart, scanning & cleaning it up in Illustrator. I’m happy with how it turned out. 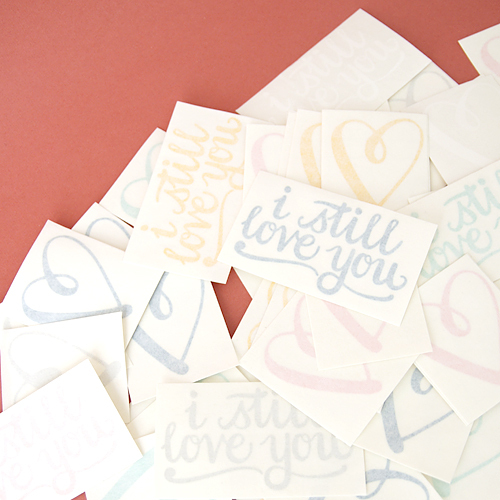 I’m having a hard time deciding what I want to plaster with my little hearts & “i still love you” stickers. It may just end up being the car. Would you like one? I’ll mail a sticker to the first 10 people that comment on this post. Ooh I want I want! So sweet…as usual! i would like one! so cute! Adorable! I would love to have one please!! I love the “I still Love you” stickers. They are very cute! I don’t need a sticker (though they are very cute! ), but I’d love a post on Illustrator. What do you love about it? I’m on the fence. Could I clean up an image similarly on Photoshop? That’s what I currently use to clean up images, and it seems to do fine. I’m wondering if Illustrator is worth the extra $$ if I’d only use a fraction of it’s functions. I would love a heart one. Super cute! LOVE these! I love the saying “I still love you” sooooo much! And I still love your blog!! DANG IT! I love the I still love you sticker but I’m the 12th, so I hope someone doesn’t get back to you with their address and you will pick me. I just got a silhouette and have yet to crack it open (it was my christmas gift). Tomorrow just might be the day. Those look great! My silhouette cutter just arrived in the post today, I’m so excited to give it a whirl. Oh shucks! I’ve been drooling over these since I first saw them on your blog. The script is gorgeous! 4 people too late… Cool giveaway though! Man! =/ There were only 3 comments how did they become 14? Darn it. those are so cute! Yes, I would love one. That’s awesome! I am so sad I missed this! I would love to ship one to my hubby so he could put it on this Armored vehicle in Afghanistan. I think that would be hilarious! Bummer, too late. I hope your pregnancy is going well. Good luck and have a great time at ALT! I’d love to go but no monies. Maybe one day. Love your calligraphy! I tried when I was younger, but never got past the old english style. Such cute stickers! Ooo!!! I want one or some! I like the heart. I am very much into the heart think right now. Super creative miss. What a seriously cute idea. You’re so clever like that. I was looking at the Alt line up today and thought of you! Good luck with your class!!! You’ll be great. I just won a free ticket to Alt and will be driving there today from Dallas! I love the site, the blog, and the design of Is Ly! I really hope to meet you there! i love your stickers. do let us know if you’ll ever put them up for sale or feel like sending more than 10 out. it’s perfect for valentine’s day. love your blog. best wishes for your pregnancy!